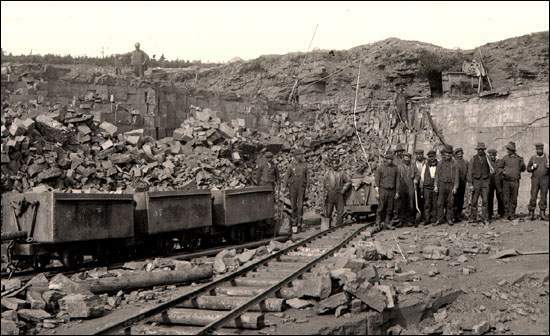 Work in the mines of Bell Island was difficult and often dangerous. Until the eight-hour day was introduced in 1943, workers often worked ten hours a day, six days a week. This meant that for about six months of the year, workers on the day shift saw daylight only on Sundays. Lighting in the mines was provided first by candles or a tin lamp that burned seal oil. In 1911, carbide lamps were introduced and in 1935 workers began wearing battery-powered electric lights on their hats. Bell Island miners at opening of No. 3 Slope, about to descend for the 6:00 p.m. shift. Candles on hats are to light their way	underground. For a long time, there were no proper bathroom or eating facilities, and the mines were often very cold. Until more modern equipment was introduced in the 1950s, ore that had been loosened up by drilling and blasting had to be loaded into trolley cars by men with shovels, a backbreaking task. Two men were expected to load at least twenty ore cars per shift. The cars were hauled by horses to the base of a hoisting slope and waiting locomotives. Each mine had underground stables and the horses were tended by specialized workers called teamsters. The mine horses became famous in the area. Many of them spent nearly all their adult lives in the mines. One is reported to have worked in Number Six Mine for twenty-six years. Under the modernization scheme of the 1950s, horses were replaced by electric trolley cars, and ore-loading was done by machines instead of hand-shovels. Safety regulations were introduced slowly. In the very early days, miners often wore home-made sealskin boots; steel-toed safety boots did not become required equipment until the 1950s. Like most mining operations, Bell Island suffered a number of accidents resulting in injury or loss of life. For a few examples, in 1938 a methane gas explosion in Number Six mine killed two men and injured several others. On January 11, 1952, a man was killed by a twenty-ton ore car in Number Three mine, and two others were killed by runaway cars in October, 1949. Industrial accidents increased in the 1950s, when new, more powerful and faster machinery was introduced. When a worker was killed on the job, it was the custom, as it was in other mines, to stop work immediately and return to the surface. For many years there were no clear age restrictions in the mines. Boys as young as ten or eleven worked at jobs such as picking ore on the conveyor belts, separating the chunks by size and discarding useless bits of rock, and many men worked until very old by today's working standards. There are several reports of men working until eighty years of age. These men often spent their last years working alongside the boys. Boys were particularly beneficial to the mining companies, since they were paid less than men. 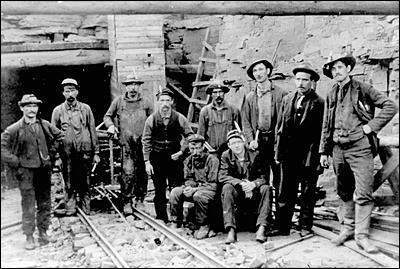 In 1916, for example, boys in the mine earned ten cents an hour while men earned 13 cents. By 1928, boys' wages were up to 19 cents and men were earning 22 cents. There are no reports of women having ever worked in the mines of Bell Island. Indeed, it was apparently believed that females in the mine would bring bad luck - that should a woman enter the mine, for example, an accident would soon occur. This may have been a carry-over from the fishery; in many places, it was believed that women in a fishing boat was bad luck. Many of the changes that were instituted to improve working conditions and wages over the years were the result of efforts by various miners' unions. The first recorded strike at Bell Island took place on August 24, 1896, when 180 workers left the job seeking a pay increase from 10 cents to 12 cents an hour. The strike was unsuccessful and the men returned to work. In July of 1900, the newly formed Wabana Workmen and Labourers' Union (WMLU) struck for a fifty per cent increase, which would bring their wage to fifteen cents an hour. That strike was settled by the agreement that became known locally as the "Treaty of Kelligrews", but not before the company had employed physical intimidation to get the workers back on the job. A strike in July of 1900 by the WMLU was settled by the agreement that became known as the "Treaty of Kelligrews". Photo by Holloway. Courtesy of Archives and Special Collections (Coll - 137, 10.13.003), Memorial University of Newfoundland, St. John's, NL. The WMLU dissolved shortly after the miners returned to work, but in 1922 another union was formed, this one affiliated with the International Union of Mine, Mill and Smelter Workers. By 1926, this union too had dissolved, and it was not until 1941, under the leadership of David Ignatius ("Nish") Jackman that the workers were once again unionized. The new union was formed primarily to combat a proposal by the company to reduce operations by fifty per cent. In 1944, it affiliated with the Newfoundland Federation of Labour, and in 1948 with the United Steel Workers of America. Steve Neary, a native Bell Islander who later became a Member of the House of Assembly, organized clerical staff under the Office Employees' International Union in 1951. Population trends on Bell Island tended to follow the fortunes of the mines. In 1891, just before the mines opened, the population was 701. By 1901, it had risen to 1,320, but for those early days population figures were often imprecise. Of this population of 1,320, one hundred and ninety-nine were said to be employed in the mines, whereas mining records indicate that there were about 1,000 men employed. The discrepancies were caused by the fact that many workers lived in other parts of Conception Bay, and travelled to and from Bell Island. It is clear, however, that the population tended to increase over the ensuing decades, as more mine workers settled their families on the island. In 1923, Bell Island surpassed Harbour Grace as Newfoundland and Labrador's second largest centre. In 1935 the population was 6,157; by 1951 it was 10,291; and by 1961 the figure had grown to 12,281. Many who came to Bell Island to work, including those who commuted to and from nearby settlements, lived in bunkhouses known as "mess shacks". These housed up to 300 men, many of whom slept on straw mattresses, and were often not a very comfortable or pleasant environment. It is little wonder that workers from other parts of Conception Bay were eager to leave on Saturdays, and so worked extra hard on Fridays in order to make their quotas of ore. Those who lived on Bell Island were less likely to speed up work to get off early at the end of the week. The mining industry permeated nearly every aspect of Bell Island life, and even now, many years after the last mine closure, districts of the town of Wabana are referred to by the names (in fact, the numbers) of the mines that once operated there. While much research remains to be done on Bell Island, and on the Newfoundland and Labrador mining industry in general, it is clear that the introduction, expansion and closure of the Bell Island mines, over a period of seven decades, had profound and lasting effects on the social and cultural fabric of the island. How did the industry change relations between men and women, and between "home" and "work"? Did the island's population become more economically and socially divided, or did their common struggles unite them? How did mining change Bell Island's relationship to the rest of Conception Bay and Newfoundland? To what extent did the people's traditional values survive or erode within the context of this new industry? These are just a few of the questions raised by this important chapter in the history of industrial diversification in Newfoundland and Labrador.